Article: Big Changes to affect Parkway! Big Changes to affect Parkway! A trio of big development proposals with profound implications for Terwilliger Parkway are working their way through the public approval process. All three relate to OHSU and how people get there and are located on Terwilliger at Campus Drive. It’s early in the process for all three proposals and FOT is determined to be there every step of the way to advocate for the preservation and enhancement of the parkway. The involvement and support of you, our Friends, will be critical to whether or not these projects improve the parkway or alter it irreparably. The Marquam Hill Connector is part of the SW Corridor light rail project and is proposed to convey people from a MAX light rail stop on Barbur Blvd. up to OHSU, which of course means crossing Terwilliger Parkway. The various Connector concepts presented by TriMet thus far will all have dramatic impacts to Terwilliger: elevator towers, bridges, retaining walls, and the loss of many trees, all in the park. Thanks to our advocacy and Commissioner Amanda Fritz, The Portland City Council has directed TriMet to minimize impacts to Terwilliger and to consider other options that don’t cross the parkway. And TriMet will include Friends of Terwilliger on a Citizen Advisory Committee that will work with them to study the options and make a selection for a Connector. That doesn’t mean we will get what we want, but it gives us a seat at the table. If that’s not enough, OHSU has also just made public their plans to build a 14 Story Hospital Addition between the Casey Eye Institute and Doernbecher Children’s Hospital on Campus Drive. Our biggest concern is their desire to add 300 new parking spaces, which will undoubtedly increase traffic on Terwilliger Blvd. and neighborhood streets. 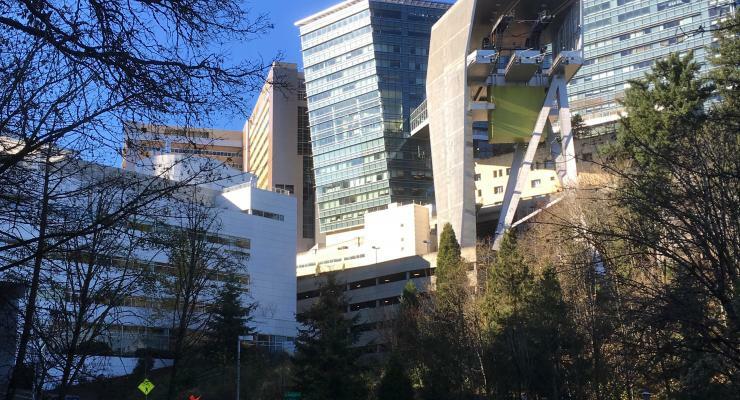 The Marquam Hill Plan from 2002 placed a parking cap on OHSU in order to control traffic on area streets, but OHSU wants to exceed those limits and has hired traffic consultants and land use attorneys to make it happen. We have additional concerns about the new parking because OHSU has failed to implement other measures called for in the Marquam Hill Plan that would reduce traffic on Terwilliger Blvd. And it comes on top of the V.A. Medical Center’s plans to add 600 new parking spaces on their property next door! OHSU is an important part of our community and region and we want them to succeed, but we don’t want to sacrifice the historic, natural, and scenic qualities of Terwilliger Parkway in the process. All of these developments will require close monitoring and timely critique. We will be attending hearings, meeting with public officials, and submitting comments for the official record. The FOT Board is a small but committed group of people, but ultimately our success will depend on You, the many Friends of Terwilliger, to send a letter or an email or show up at a hearing or otherwise make your support known. Please keep an eye on our social media pages, website, and future newsletters for our calls for support. And please let us know if you would like to be more actively involved in monitoring and responding to these projects or serving on our board!